Thanksgiving is almost here! 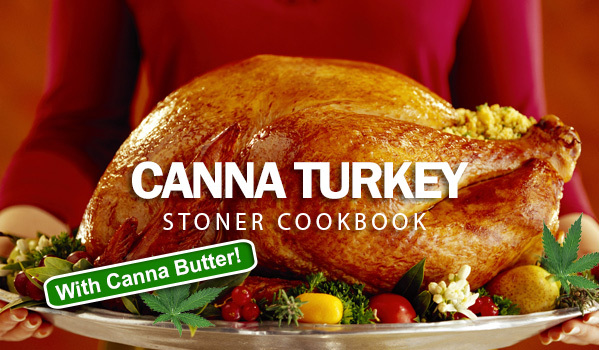 So here is a great danksgiving turkey recipe. Melt the cannabis butter in a small saucepan over low heat and blend in remaining ingredients. Stuff the turkey and/or season it with salt and pepper, if desired. Make a small incision in the skin of the turkey. Force a finger through the slit and break the contact between the skin and the meat. Using a meat injector, squirt half the butter mixture under the skin. Cook the turkey according to your favorite method, basting it with the remaining butter mixture every half hour until it’s done. We cooked it on a Traeger grill and it was juicier and more moist than any turkey I have ever had before. This entry was posted in Featured, Stoner Blog, Stoner Cookbook and tagged cookbook, stoner.